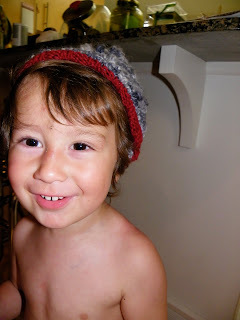 My friend Tara Czepiel knitted these fabulous hats for the kids. Know what's even cooler? She had her husband deliver them, out of the blue! Thank you, Tara (& hubby)!!! LOVE the hats!! So awesome! And the kids look SO adorable in them! Aw, I love them! Very rasta-esque.